This is a revised fork based on the old kotolegokot one. 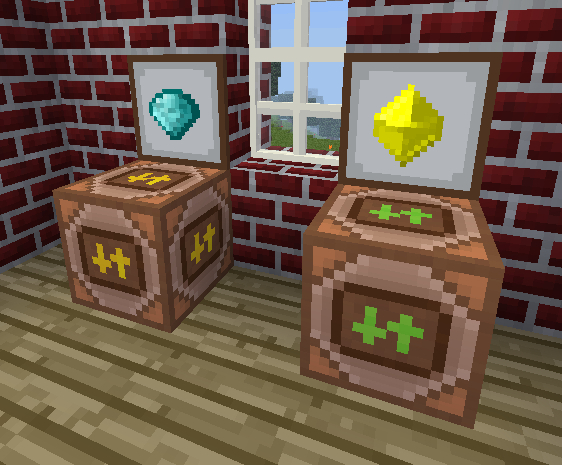 This mod adds commerce in Minetest. No unnecessary functions and code cleaning. Show the money account on the right-down corner. Only the two essential shops : player's shop and admin shop (unlimited stock). Licenses : GPLv2/later for the code, WTFPL for the textures. Last edited by jp on Mon May 25, 2015 09:43, edited 4 times in total. The mod is great. Much better than some other shop systems. It would be nice if there was an option to search for a node when you setup the shop. Just like in worldedit GUI. It works very well but we need to improve performance a little to reduce CPU usage on server. actually HUD is updated in world loop process, but we need to change it per event. Is this mod compatible with the old money mod? Krock wrote: Is this mod compatible with the old money mod? Yes, but be aware that the Barter shops are removed. Also, update : performances improvement by nerzhul (nrz) and re-working of the shop interface (WIP). Is it possible to change the texture when the shop is empty? it is really annoying to open 10 shops just to see that the owner did not restock them. There seems to be a issue, no matter what i can't get the shops to tune. I know I am doing it right because i have been using kotolegokot and Xiong's version for well over a year. nrz wrote: It works very well but we need to improve performance a little to reduce CPU usage on server. actually HUD is updated in world loop process, but we need to change it per event. What has a shop system got to do with the HUD? Or why does it cause CPU usage? lightonflux wrote: Is it possible to change the texture when the shop is empty? Empty shops are indeed a problem of many mods. Perhaps the infotext could be extended: "Get 3 mese crystals for 2 diamonds at Sokomines shop. Only 5 left!" or "SOLD OUT" if it's empty. Is it not possible to change a nodes texture under certain conditions? lightonflux wrote: Is it not possible to change a nodes texture under certain conditions? So it would make sense if the engine would provide a more efficient method? As Sokomine said, better to use an infotext for that. The problem with info texts is that you have to face the node close by. On a server with over 200 shop nodes on one spot this is very annoying. Just visit "Liberty Lands" and go in "Messias Shop" or any other bigger shop (as in building). A simple text it is definitely better than opening the shop menu, but visual indication on the node would be so much more elegant. 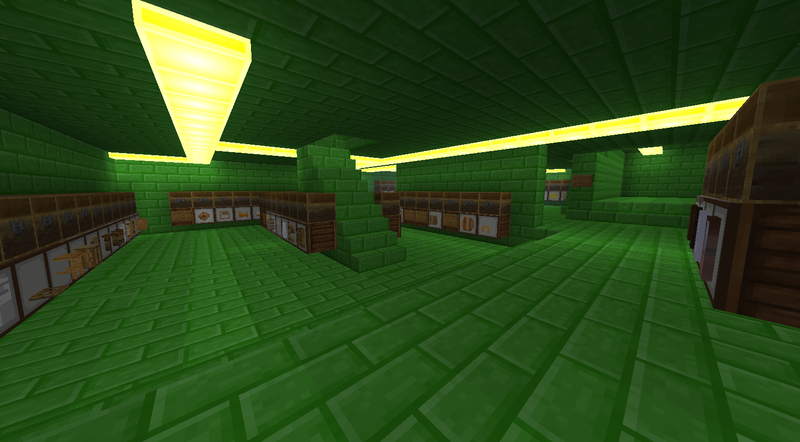 : http://i.imgur.com/pLk8kLG.png It has several floors and is not the only shop on the server. They also have ikea. lightonflux wrote: A simple text it is definitely better than opening the shop menu, but visual indication on the node would be so much more elegant. Who said they'd exclude each other? The infotext is for fast identification of shops that might be of intrest to the customer (or where the seller might have to refill). More details - like the exact pictures - can be shown in the formspec where the actual sale takes place. It would be awesome if you could connect these to digilines/luacontrollers, and use them to adjust the prices. This might cause some problems with people "hacking" other people's shops with luacontrollers, but this could probably be fixed by only letting the owner place digilines and luacontrollers near the shop. -only allow the shop to connect in one spot (probably the back), and only directly to the luacontroller. no digiline wires. OR, you could add another type of shop that can be programmed by itself, without the need for luacontrollers. This mod looks very nice. I want to use it on my "server". 2018-02-06 16:13:27: ERROR[Main]: Siehe debug.txt für Details. I know that this mod is old. But I'm new in Minetest and don't know why I get this error. where can i doawnload this mod? Isja Krass wrote: where can i doawnload this mod?